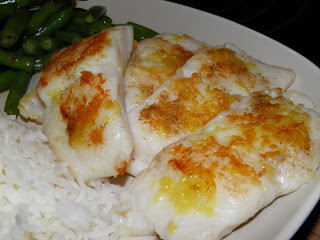 Another home alone evening when I indulged myself with fish - yup, all 300g of white catfish for me! As usual, I didn't want to cook up a storm for just myself, so I simply marinated and fried the catfish. The freshly grated ginger did wonders and the fish was so delicious. I just served them with some steamed green beans and basmati rice, and it was a very satisfying dinner for one! 1. In a small bowl, mix the ginger, garlic, salt, and white pepper. Rub the gingery mixture all over the fish and let it stand for 5 to 10 minutes. 2. Heat some olive oil in a pan over high heat, and fry the catfish for 8 to 10 minutes, turning occasionally.